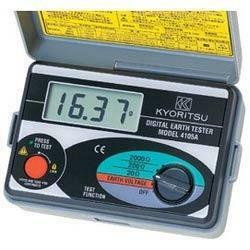 Our product range includes a wide range of fluke earth tester, analog earth tester, digital earth resistance tester, waco digital earth resistance tester, digital earth tester and kew digital earth tester 4105a. 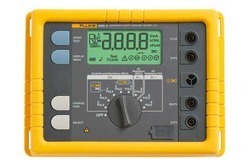 The new Fluke 1623-2 and 1625-2 GEO Earth Ground Testers offer data storage and download capabilities via USB port. World class accessories will simplify and speed up testing time. The testers are also easy touse. 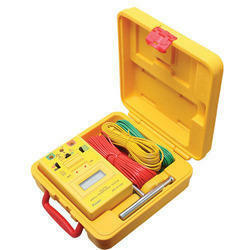 For each test,the testers inform you which stakes or clamps need to be connected and the large rotary switch can be used even with a gloved hand.The complete model kit comes with the 1623-2 or 1625-2 tester, test leads, 4 earth ground stakes, 3 cable reels with wire,2 clamps, batteries, and manual—all inside a professional Fluke carrying case. Measuring time Typical 6 sec. NIPPEN's Insulation Testers are used for direct reading of insulation resistance of electrical rotating machines, power distribution lines, communication cables, insulators , control and switching equipment etc. They are robust instruments, incorporating a built-in-hand driven generator and a solid-state circuit for a stabilized D.C. output. They are robust instruments, incorporating a built-in-hand driven generator and a solid-state circuit for a stabilised D.C. output. NIPPEN Insulation Testers meet the requirements of Indian Standard Specifications IS.2992-1987 for Insulation resistance measuring instruments. (i) An injection moulded ABS plastic case, where the unique geometry of the cabinet makes it practically unbreakable due to accidental falls and bumps. (ii) A sturdy and elegant Aluminium cast case with carrying handle which makes the instrument conveniently portable. The tester has two sections and is dust free. The rotary magnet type generator runs smooth with minimum noise because of the excellent dynamic balance of rotating parts. Note: Any other combination of ranges can also be made to specific requirements. is suddenly inserted between measuring terminals. Limits of error The insulation resistance measurement is accurate to within ± 5% of the indicated value at the Scale mark of the rated resistance, in conformity with IS:2992-1987 stipulations. Tolerance on Voltage Within ± 10 of the rated voltage for scale mark of infinity & more than 90% of the rated voltage for the central scale marks. Accuracy of Voltage The testers are provided mainly to determine whether the equipment under test is live or not, and not for any accurate measurement work. However the accuracy is within ± 10% F.S.D. Tilt influence Less than 0.5mm deflection from the infinity scale mark, due to an inclination of 5 degrees from the horizontal. ambient temperature change of 20 degrees from 27 Degree C.
Influence of humidity Within the rated accuracy, at relative humidity of up to 90%. 2) More than 50 Mohm between the electric circuits and case for rated voltage above 250V. Accessories (supplied with instrument) : Test leads and instruction manual. (supplied optional at extra cost) : Carrying case. 2mA measuring current permits the testing of earthresistance without tripping earth leakage current circuitbreakers in the circuit. Battery operated. Data hold function. Measuring system Earth Resistance by constant current inverter 820Hz approx. 2mA. 3 ½ digit LCD display with Max reading 1999. 4 Wire Soil Resistivity Measurements. 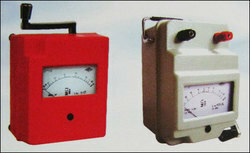 Measurement Method – 3 terminal & 4 terminal. Type tested as per IS-9223. Accuracy: ± 1.5% of reading ± 5 dgts valid from 10% of reading to 95% of the range. Test Current: 20-Ohm range: 10mA AC rms. , 200-Ohm range: 1mA AC rms. ,2000-Ohm range: 100μA AC rms. Test current is generally constant throughout the range. Earth voltage Range: 0-200V AC. Resolution: 0.1V Accuracy: 2% of the Range. Interference: Interference voltages of 20V ±5% peak to peak,50Hz in the potential circuit will have maximum effect of ±1% on the reading obtained for the 20 Ω to 2kΩ range. Humidity: Operating: 95% RH non condensing max at 40°C, Storage: 93% RH max. at 55°CFlash Test: 3kV AC. Voltage with stand:In the event of system fault, the instrument will with stand 240V AC applied between any two terminals. Power supply:Internal, rechargeable Ni-MH 1.2V, 600mAh x 8 Nos. Single Charge battery life:Approximately 5-6 hrs of continuous operation on mid ranges. Standard Accessories : Operating instruction Manual & Battery Charger. Optional Accessories : Carrying bag contains:A..four spikes of 10mm dia, 450 mm long.B.10m,20m,30m & 40m of cable on winder as standard.C..hammer. Designed to meet IEC61010-1, IEC61557 safety standard. Small and Iightweight. Shock resistant new case material and taut-band movement. 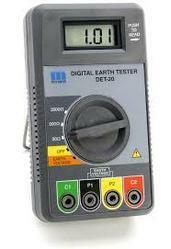 Looking for Earth Tester ?